It’s been nearly 50 years since the florin (or 2 shilling) coin circulated in Australia. If you’ve come into ownership of a florin, perhaps in an inheritance, a lucky find digging in the garden or discovered in the the drawers of an old cupboard then you might be asking yourself what’s an Australian florin worth? Well, there’s two things to take into account. The first, is the year of the coin. Prior to 1946 each 11.31 gram Australian two shilling piece contained 92.5% silver which is just over 1/3 of an ounce of silver. 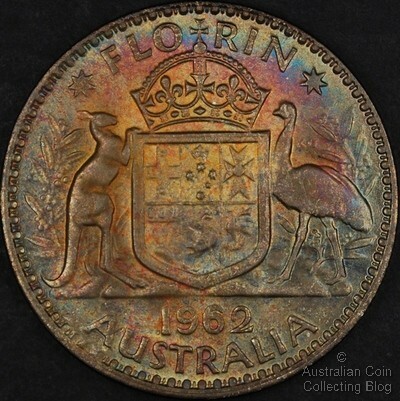 At the time of writing pre 1946 florins (or “pre florins”) have a melt value of AU$9.54 regardless of their condition. Florins minted from 1946 to 1963 contained only 50% silver which amounts to 0.1818 of an ounce of silver. These “post florins” have a silver bullion value of AU$5.15 at time of writing. Remember that you can use our Australian Silver Coin Calculator to calculate the melt value of Australia florins. The second thing to consider when determining what your Australian florin is worth is the grade of the coin. Now, coin grading is a complex topic and we won’t go into details here but be aware that an uncirculated coin can be worth many multiples of what a circulated coin of the same year is worth. An uncirculated coin is one that has not been in circulation and has no wear or metal removed from it. It doesn’t necessarily mean that the coin is shiny and bright so don’t be tempted to polish up your florins to make them look better as this can ruin any numismatic value they might have. An example of grade affecting value is the Australian 1956 florin. A lovely, choice uncirculated florin of this relatively late year could be worth $400 or more. A well worn coin of the same year is really only worth the silver it contains or a fraction more than $5. ‹ Australian Shilling Value, What is my Australian Shilling Worth?